1. The New Mass is not an unequivocal Profession of the Catholic Faith. Unlike the traditional Latin Mass it is ambiguous and Protestant. Therefore, since we pray as we believe (lex orandi lex credendi) it follows that we cannot pray with the New Mass in Protestant Fashion and still believe as a Catholic. 3. The New Mass leads us to think "that truths ... can be changed or ignored without infidelity to that sacred deposit of doctrine to which the Catholic Faith is bound forever." (Cardinals A. Ottaviani and A. Bacci to Pope Paul VI A Critical Study of the Novus Ordo Missae). 4. The New Mass represents "a striking departure from the Catholic theology of the Mass as formulated in Session XXII of the Council of Trent" which, in fixing the "canons," provided an "insurmountable barrier to any heresy against the integrity of the Mystery." (Cardinals A. Ottaviani and A. Bacci to Pope Paul VI A Critical Study of the Novus Ordo Missae). 5. The difference between the two is not simply one of mere detail or just modification of ceremony, but "all that is of perennial value finds only a minor place (in the New Mass), if it subsists at all." (Cardinals A. Ottaviani and A. Bacci to Pope Paul VI A Critical Study of the Novus Ordo Missae). 6. "Recent reforms have amply demonstrated that fresh changes in the liturgy could lead to nothing but complete bewilderment in the faithful who already show signs of uneasiness and lessening of Faith." (Cardinals A. Ottaviani and A. Bacci to Pope Paul VI A Critical Study of the Novus Ordo Missae). 7. In times of confusion such as now, we are guided by the words of our Lord: "By their fruits you shall know them." Fruits of the New Mass are: 30% decrease in Sunday Mass attendance in U.S. (NY Times 5/24/75), 43% decrease in France (Cardinal Marty), 50% decrease in Holland (NY Times 1/5/76). 8. "Amongst the best of the clergy the practical result (of the New Mass) is an agonizing crisis of conscience..." (Cardinals A. Ottaviani and A. Bacci to Pope Paul VI A Critical Study of the Novus Ordo Missae). 10. "The pastoral reasons adduced to support such a grave break with tradition ... do not seem to us sufficient." (Cardinals A. Ottaviani and A. Bacci to Pope Paul VI A Critical Study of the Novus Ordo Missae). 11. The New Mass does not manifest Faith in the Real Presence of our Lord -- the Traditional Mass manifests it unmistakably. 12. The New Mass confuses the REAL Presence of Christ in the Eucharist with His MYSTICAL Presence among us (Protestant doctrine). 13. The New Mass blurs what ought to be a sharp difference between the HIERARCHIC Priesthood and the common priesthood of the people (Protestant doctrine). 14. The New Mass favors the heretical theory that it is THE FAITH of the people and not THE WORDS OF THE PRIEST that makes Christ present in the Eucharist. 15. The insertion of the Lutheran: "Prayer of the Faithful" in the New Mass follows and puts forth the Protestant error that all the people are priests. 16. The New Mass does away with the Confiteor of the priest, makes it collective with the people, thus promoting Luther's refusal to accept the Catholic teaching that the priest is judge, witness and intercessor with God. 17. The New Mass gives us to understand that the people concelebrate with the priest -- which is against Catholic theology! 18. Six Protestant ministers collaborated in making up the New Mass: George, Jasper, Shepherd, Kunneth, Smith and Thurian. 19. Just as Luther did away with the Offertory -- since it very clearly expressed the sacrificial, propitiatory character of the Mass -- so also the inventors of the New Mass did away with it, reducing it to a simple Preparation of the Gifts. 22. By grave omissions, the New Mass leads us to believe that it is only a meal (Protestant doctrine) and not a sacrifice for the remission of sins (Catholic Doctrine). 25. We are faced with the dilemma: either we become Protestant by worshipping with the New Mass, or else we preserve our Catholic Faith by adhering faithfully to the traditional Mass, the "Mass of All Time." 28. Beautiful, familiar Catholic hymns which have inspired people for centuries, have been thrown out and replaced with new hymns strongly Protestant in sentiment, further deepening the already distinct impression that one is no longer attending a Catholic function. 29. The New Mass contains ambiguities subtly favoring heresy, which is more dangerous than if it were clearly heretical since a half-heresy half resembles the Truth! 30. Christ has only one Spouse, the Catholic Church, and her worship service cannot also serve religions that are at enmity with her. 31. The New Mass follows the format of Cranmer's heretical Anglican Mass, and the methods used to promote it follow precisely the methods of the English heretics. 32. Holy Mother Church canonized numerous English Martyrs who were killed because they refused to participate in a Mass such as the New Mass! 33. Protestants who once converted to Catholicism are scandalized to see that the New Mass is the same as the one they attended as Protestants. One of them, Julien Green, asks: "Why did we convert?" 34. Statistics show a great decrease in conversions to Catholicism following the use of the New Mass. Conversions, which were up to 100,000 a year in the U.S., have decreased to less than 10,000! And the number of people leaving the Church far exceeds those coming in. 36. The nature of the New Mass is such as to facilitate profanations of the Holy Eucharist, which occur with a frequency unheard of with the Traditional Mass. 37. The New Mass, despite appearances, conveys a New Faith, not the Catholic Faith. It conveys Modernism and follows exactly the tactics of Modernism, using vague terminology in order to insinuate and advance error. 38. By introducing optional variations, the New Mass undermines the unity of the liturgy, with each priest liable to deviate as he fancies under the guise of creativity. Disorder inevitably results, accompanied by lack of respect and irreverence. 39. Many good Catholic theologians, canonists and priests do not accept the New Mass, and affirm that they are unable to celebrate it in good conscience. 40. The New Mass has eliminated such things as: genuflections (only three remain), purification of the priests fingers in the chalice, preservation from all profane contact of priest's fingers after Consecration, sacred altar stone and relics, three altar clothes (reduced to one), all of which "only serve to emphasize how outrageously faith in the dogma of the Real Presence is implicitly repudiated." (Cardinals A. Ottaviani and A. Bacci to Pope Paul VI A Critical Study of the Novus Ordo Missae). 41. The traditional Mass, enriched and matured by centuries of Sacred Tradition, was codified (not invented) by a Pope who was a saint, Pius V; whereas the New Mass was artificially fabricated by six Protestant ministers and a 33rd degree Freemason, i.e., Msgr. 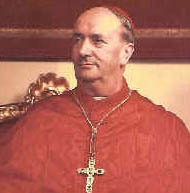 A Bugnini who was later exiled from the Vatican because of his ties with Freemasonry. 42. The errors of the New Mass, which are accentuated in the vernacular version, are even present in the Latin text of the New Mass. 43. The New Mass, with its ambiguity and permissiveness, exposes us to the wrath of God by facilitating the risk of invalid consecrations: "Will priests of the near future who have not received the traditional formation, and who rely on the Novus Ordo Missae with the intention of 'doing what the Church does,' consecrate validly? One may be allowed to doubt it!" 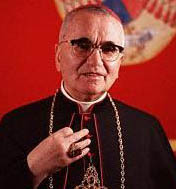 (Cardinals A. Ottaviani and A. Bacci to Pope Paul VI A Critical Study of the Novus Ordo Missae). 44. The abolition of the Traditional Mass recalls the prophecy of Daniel 8:12: "And he was given power against the perpetual sacrifice because of the sins of the people" and the observation of St. Alphonsus de Liguori that because the Mass is the best and most beautiful thing which exists in the Church here below, the devil has always tried by means of heretics to deprive us of it. 47. The intrinsic beauty of the Traditional Mass attracts souls by itself; whereas the New Mass, lacking any attractiveness of its own, has to invent novelties and entertainments in order to appeal to the people. 48. The New mass embodies numerous errors condemned by Pope St. Pius V at the Council of Trent (Mass totally in vernacular, words of Consecration spoken aloud, etc. See Condemnation of Jansenist Synod of Pistia), and errors condemned by Pope Pius XII (e.g., altar in form of table. See Mediator Dei). 49. The New Mass attempts to transform the Catholic Church into a new, ecumenical church embracing all ideologies and all religions -- right and wrong, truth and error -- a goal long dreamt of by the enemies of the Catholic Church. 50. The New Mass, in removing the salutations and final blessing when the priest celebrates alone, shows a denial of, and disbelief in the dogma of the Communion of Saints. 52. The New Mass no longer constitutes a vertical worship between God and man, but rather a horizontal worship between man and man. 53. The New Mass, although appearing to conform to the dispositions of Vatican Council II, in reality opposes its instructions, since the Council itself declared its desire to conserve and promote the Traditional Rite. 54. The Traditional Latin Mass of Pope St. Pius V has never been legally abrogated and therefore remains a true rite of the Roman Catholic Church by which the faithful may fulfill their Sunday obligation. 57. Pope Paul VI, when asked by Cardinal Heenan of England, if he was abrogating or prohibiting the Tridentine Mass, answered: "It is not our intention to prohibit absolutely the Tridentine Mass." 58. Because "In the Libera Nos of the New Mass, the Blessed Virgin, the Apostles and all the Saints are no longer mentioned; her and their intercession thus no longer asked, even in time of peril." (Cardinals A. Ottaviani and A. Bacci to Pope Paul VI A Critical Study of the Novus Ordo Missae). 59. In none of the tree new Eucharistic Prayers (of the New Mass) is there any reference ... to the state of suffering of those who have died, in none the possibility of a particular Memento, thus undermining faith in the redemptive nature of the Sacrifice. (Cardinals A. Ottaviani and A. Bacci to Pope Paul VI A Critical Study of the Novus Ordo Missae). 60. We recognize the Holy Father's supreme authority in his universal government of Holy Mother Church, but we know that even this authority cannot impose upon us a practice which is so CLEARLY against the Faith: a Mass that is equivocal and favoring heresy and therefore disagreeable to God.